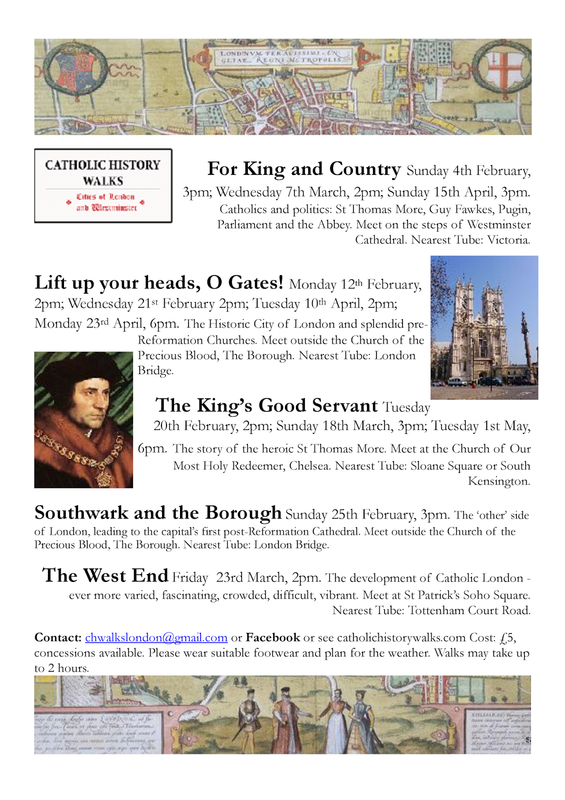 Parish Catechises Presentation: This Friday - 26th January 8pm in the club. Please join Fr Przemek for the second of our Parish Catechises groups where we will continue with the beautiful panoramic programme on “Catholicism” by Fr Robert Barron. All over the world this attractive series has been translated into scores of different languages and has become universally popular. Think about coming and trying out this series. It is a way to enlarge our mind and heart. It is a way to increase our knowledge and understanding of the Good News of Jesus Christ which sets us free and gives us a huge reason to live and love with energy. So many of us get caught up in the forest of routine and pressure that we cannot see the wood for the trees and rarely have time to even think (let alone discuss) the amazing reasons for our existence. Too busy? Surely not too busy to live and have a life? What about “the life which is life indeed.” Make time this coming Friday and step out of that boring routine and try it out! Confirmation Application Forms: Last chance to get your application form in this weekend. Please see Fr Przemek ASAP. We hope to get the programme and welcome letters out in the next week or two. 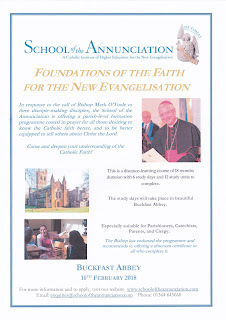 Bishop Patrick Lynch will come here for Confirmation on Sunday 27th May. 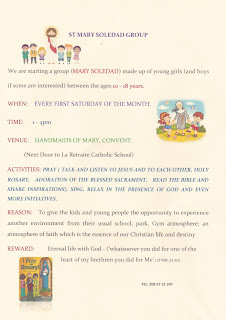 First Communion Programme 2018: starts next Sunday with the 9.30 Mass. Afterwards the children will go to their class with Mrs Keane & Mrs Marshall and the parents will have a meeting with fr Christopher. Fr Christopher is still in Egypt (where he was born) and is planning on returning tomorrow. He has seen fr Athanasius & fr Andrawes (hopes to see fr Yassa as well) to hand over our Family Fast collections for their poor. Special Sunday - 11am Mass today: Sung by Cantores Missæ under the direction of Mr Charles Finch, our traditional Latin Mass today will include the following music. After the last Gospel: Alma Redemptoris Mater (Giovanni Perluigi da Palestrina). 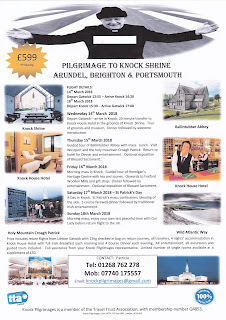 Next Special Sunday 18th Feb – 1st Sunday of Lent. Jeremiah Hourigan RIP: On Tuesday we received the sad news that Jerry had passed away. He was the School Caretaker of St Bernadette and La Retraite Schools for many years and is very fondly remembered by past pupils and teachers. Our thoughts and prayers go to his family. Billy Connaughton RIP: His requiem will take place at St Mary’s in Clapham on Monday 12th February at 12.30pm (time to be confirmed). 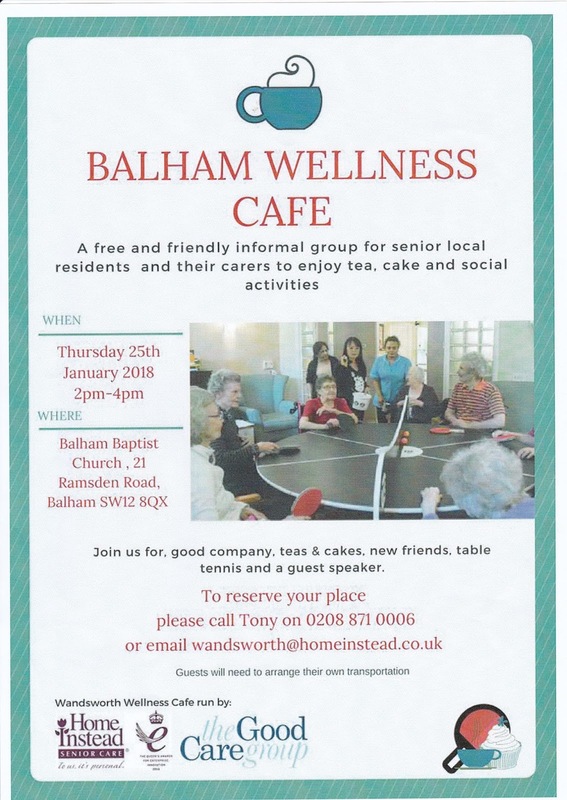 Balham Wellness Cafe: A free and friendly informal group for senior local residents and their carers to enjoy tea, cake and social activities. Thursday 25th January 2-4pm at Balham Baptist Church, 21 Ramsden Road. To reserve a place please call Tony on 8871 0006.